ON SALE ITEMS ( BONGO ) ::: Furniture for the Home, Office, Home Office, and More at Pure Design Online! Karim Rashid designed the Bongo in 1999 using his trademarked organic form with sensuous curves. Yet the multifunctional capabilities of the Bongo are what sets it even further apart from those that have since tried to copy it. 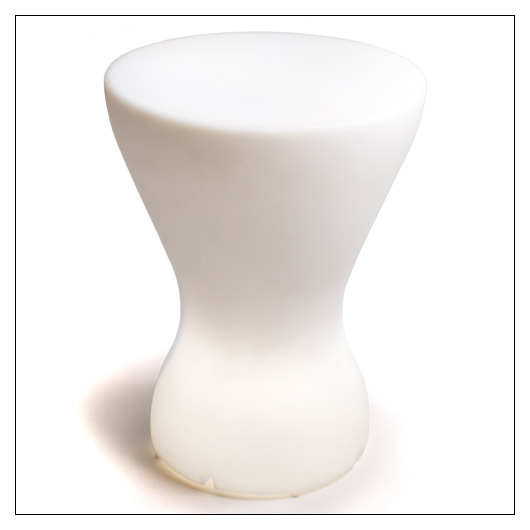 The Bongo is a simple stool, yet it is also a low energy consuming lamp perfect for setting the right mood in any room. Finally, it is stackable so it becomes a tower of light, a rainbow column, or a wall of light - create your own. Available in four colors: Soft White, Sky Blue, Hot Pink, and Misty Green. Rotationally molded plastic is non-toxic and odorless. Replaceable bulb is 12 volts, and available at hardware and general merchandise stores. Cord and adapter are UL approved for use in US households (110V, 50-60Hz power). IMPORTANT: Not recommended as a stool for children, due to its height and center of gravity. Please use as a light/decoration only in children's rooms.